Thank you for a great website. I've been totally absorbed for hours... Wonderful, sentimental and very, very special! Your website is one of the most beautiful I have come across on the net: full of care, quirky without being wacky, elegant and touching. It is an excellent way of understanding the pleasures of Psychogeography, and really brings out a sense of the atmosphere that these places have. I can almost smell the Formica tabletops through the monitor. Congratulations. You are such a hero! ... Big time charming... I do hope there's still hope for the poor kids being brought up by Ronald McF*cking Donald. Such passion, beauty and dedication... We are definitely going to bring our friends and invade your top-ten caffs this summer! Thanks for a lovely site! What a great website! Love everything about it. Can't wait to check out those places next time I'm in London. Consistently brilliant... If you've never visited before then we can tell you Classic Cafes celebrates, champions and attempts to protect and preserve the 'Italian-styled Formica cafe/coffee bars' that remain in the capital... proprietor, Adrian Maddox, is one of the most dedicated and passionate people we've ever encountered (for the full story check out his book). What a great web site! Hours of pleasant nostalgia. In 1953 I used to frequent the Pam Pam coffee house. It was at the junction of Hanover St W1 and Hanover Square and was memorable in that it was the first cafes that I heard jazz played - not on a juke box but from the owner's Dansette - 78's of Oscar Peterson were his favorite. Us arty students from the then Regent Street Poly used to hang out there after classes. There was a small upstairs section and they served the very novel 'open sandwiches from Norway' - a slice of rye bread with a piece of lettuce and a hard boiled egg. Talk about exotic! Congratulations and keep up the crusade. Many thanks for the superb website. It is rare that we find a site that entertains us more than our own... and even rarer to find one which reduces us alternately to tears of nostalgia and indignant rage. Adrian Maddox has built this beautiful site as a clear labour of love. It is a paean to the passing of proper English Cafes in all their Formica-clad, steamed up, slop-serving gorgeousness. Illustrated with breathtaking black and white photographs and written with crisp wit and full rigour, we defy you not to spend an hour wandering around the site and the rest of your life seeking out the Cafes. Adrian Maddox has created something of simple beauty and real social importance. If we could say that we'd die happy. Wonderful site - great tone, beautiful pictures, an amazing resource. Just to let you know that yesterday I travelled from Bristol to 'do' the full cafe tour. Had a fantastic time... Although Pellicci's and the New Piccadilly were amazing, in some ways Scotti's was my favourite, I had a cup of tea and a chat (with the owner's son?) in there and couldn't believe how untouched by the pasing years it was, brilliant! We discussed Starbucks etc and he was saying he couldn't believe they got away with charging 75p for a cup of tea - I had to tell him they charge a lot more than that, which he couldn't believe! Anyway thanks for providing the tour info, it makes for a great day, I think the best part was probably speaking to the owners in the three cafes I lingered in (Pellicci's, Scotti's and the New Piccadilly) - Lorenzo described me as a 'pilgrim'! Discovered your site a few months ago and I've been fascinated by it ever since. Last weekend I came down to the smoke for a few days so I decided to investigate a couple of your recommendations. The New Piccadilly was wonderful with its swirly-patterned yellow Formica table tops and transparent cups and saucers. And as for Pellicci's! I originally thought your "See Pellicci's And Die" tag was a bit over-the-top but you're right; it's like going to heaven! Wonderful decor, great atmosphere and the best staff of any eating establishment anywhere in the UK. Nevio jnr noticed my Accy Stanley footy shirt (I was on my way to the match at Dagenham) and immediately fell into conversation with me. On my was out I was thanking the ever-courteous Nevio senior, and telling him how I found out about his cafe from your site, when Nevio jnr plonked a carefully wrapped parcel in my hands and said: "That's some bread pudding for you, so you don't go hungry at half-time!" Can you imagine that happening in Starbucks? Magnificent... a really beautiful piece of work. Sad beyond words to learn of the demise or impending closure of more cafés, especially the New Piccadilly. At least you have the satisfaction of having recorded their existence in your unique book which surely deserves an award for so attractively and comprehensively combining form with content. My exposure to classic cafes really took off when I moved to London in late 1993... we lived in Finchley, and I counted 32 eating places on my 10 minute walk to Finchley Central tube. These included a genuine classic, Roberto's in Long Lane N3 - small, crowded, steamy, son cooking and mother waitressing and a near classic, the Welcome Cafe in Ballards Lane N3. The Welcome Café was then run by a comedy Italian family who had ferocious arguments, usually led by the fiery teenage daughter, and plates and cutlery would fly around the kitchen... I got off the Northern Line at Tottenham Court Road, and walked the short distance to High Holborn passing, in no particular order, the Tea Rooms in Museum Street, Zita, another excellent one in New Oxford Street whose names escapes me, Berni, and Chez Monique. Every day I would stop at one or the other, read my paper, and think about the dull day ahead... Now I work in Kensington and have the delights of Frank's (run by a splendidly bad-tempered, short, stocky, Roman-nosed father and son firm) and the Pembroke Café within a short walk. Frank's is a visual joy but not I think a place to sit in for any length of time, unlike the Pembroke where the binmen and builders mingle with the taxmen and DIY shop staff. Absolutely stupendous site. Truly amazing. I have spent hours reading and printing most of the info and my next project will be to arm myself with a list of caffs that I can investigate over the next few months! Thank you for providing me with so much pleasure. Will keep returning to the site for more updates. A very good site indeed... I am very familiar with many of the items [as] my father was a carpenter who did shop fitting from time to time. The family home was festooned with stuff. We used to joke that it would all come back into fashion one day. Our bathroom had exactly the same three colours you use on your photo montage background: mauve, blue and grey. I am not sure if it was Formica. Our Dad was always on about something called Warerite. Our bathroom looked like a chip shop. Three different Formica panels half way up the wall, separated by a black PVC strip. I can remember the smell of Evostick as all this was being laid up. We had a Formica covered table as well as a formal dining table and he even used a grey wood finish Formica for the bedroom cupboards. Family holidays, in places like Littlehampton, meant you always ate out in places like those on your site. There was nothing else available within a family budget... I hope the closure trend is reversed. I have passed web details on to friends and colleagues and they also love the site. What a gorgeous site. And what a necessary labour of love to catalogue it all before it goes. I was down in East Dulwich only the other weekend, mourning the substitution of an underwhelming new orange plastic sign for the Café Ideal (original frontage of chrome letters mounted on pistachio green Formica.) Where are they now: the chrome and crimson leather of the Three Sons on Lavender Hill? ; Forest Hill's Station Café, with its rudimentary wooden booths, and gaggle of late 70s punks hunching over the Gottlieb pintable or dropping 5ps in the Rock-Ola for another dose of the Buzzcocks or The Clash? ; the Herne Hill Restaurant run by an unlikely gay couple - Little Jerry (short, brash, foulmouthed, beloved of pensioners, fond of a silver identity bracelet) and Big Jerry (large, muscular, bashful, former policeman)? ; The Sorrento in West Norwood, a handy cherub's throw from the pleasingly gloomy necropolis of Norwood cemetery... How soon before this prelapsarian Eden is submerged entirely beneath a wave of branded homogeneity? I'm a great fan of your site which I find manages to entertain and depress me in equal measures. I'm sorry to report that you can add John's in Chalk Farm Road to the list of recent closures. Inside the furniture is scattered around as if the owners had to leave in a hurry after a rude early-hours visit from the coffee chain gestapo. To complete this miserable picture, the word "closed" with a backwards S is daubed in white paint on the front window. Please keep up the good work, while there are still some cafes to enjoy. I am a huge fan of the Classic Cafes website and your book is top of my Christmas wish list! I have a suggestion that you might consider adding to the site... C Notarianni & Sons on Battersea High Street - a long-standing Italian cafe that retains a fair deal of its 1950s atmosphere and charm. Congratulations for your web page! It is marvellous!! I love Clasic Cafes and I have recently moved to London so it has been wonderful to discover your site. You should include information about classic cafes at Buenos Aires. The local government has launched an initiative to attract people to them and not let them die and there are some incredible ones! Just like to say ...what a fantastic site, I see it as an important part of our culture as much as historical Castles and houses, I recently visited the York Gate Cafe in Broadstairs... how could anyone be so destructive as to rip out such an interior? Anyway it made my heart sink. I remember spending many a wet afternoon sitting at the Green Vitrolite window table watching the world go by. Thanks for the great site. My mates and I often talked about something like this but why when you've done it better than we imagined. Love the site to distraction. Marvellous. Really enjoyable. Put me down for a copy of the book. Have just returned from Pellicci's, at your recommendation - steak-and-kidney pud, mash and mushy peas, followed by golden-syrup sponge, washed down with tea, and accompanied by the irresistible Italian charms of Nevio Sr and Jr. A perfect afternoon! thank you! My friends and I plan to do the No 8-bus caff tour very soon, and look forward to the publication of your book! Just like to thank you for setting up this website. I have used it help me with my investagation into 60s cafes for an art project. Keep up the good work. A great site... I'm sad to say that The Mug of Tea cafe on Cambridge Heath Rd looks to be dead. Its been closed for quite a while now, the lettering started to drop and became the very Bill Drummond 'Mu of Tea' for a while. Now being renovated and doubtless ruined. Such a sad thing to pass a dead cafe. One of my friends moved into a dead pub once which had been granted residential status - I didn't speak to him again. I heard an even worse tale that someone I know has bought the Pie & Mash on Well St Market in Hackney and is turning it into a studio/ery. "They are keeping the front as it was originally" I was told. I might kill them. I've just been looking at your website; wonderful idea. Cafe's were and are a traditional part of London and some of the few places where you can get a meal without being ripped off! It might be worth mentioning my mum and dad's cafe under your 'Lost Cafes' section. Mum and dad ran 'George's Cafe' in Columbia Road, Bethnal Green from 1964 - 1995. It was very popular and well known because of the famous flower market on Sundays. It had the formica tables and counter and served homemade apple pie and steak pies etc. Even today, the old regulars still miss the cafe. It was tragically turned into a posh restaurant! Love the website... perhaps you could take a look at the two Castle cafe's 100 metres apart in EC2. The one on Paul Street is the killer: stool seating great sandwiches, fine old school shelf stacking and a very warm & friendly Italian family behind the counter. The one on Tabernacle St is lacking a little in atmosphere. Hated to see your story on the death of the Regent Milk Bar - the perfect revival spot after trawling through Bell Street market. Felt the same sinking feeling on finding the guts - wooden booths, back lit false ceiling and orange pendant lights - had been ripped out of Brunchies on Great Portland Street. No more £2.95 all day breakfasts. Why has it taken me until now to discover this site? It is superb. My next holiday destination has now been decided. Like all the others, I want to congratulate you on your fantastic site. Finding this comes just days after being introduced to the vitrolite nirvana of the Regent Milk Bar on Edgware Road. You've done what I've wanted to do for some years now (but which like so many other things became a back-burner project). And you've done it so spectacularly well, I'm humbled. Whilst living in Walthamstow 8 years ago, and so familiar with Ferrari's, Roma, La Paga, and a fantastic vitrolite milkbar on the High Street that was badly modernised when I was living there, it was apparent that these fantastic fronts and interiors were now living a precarious existence and should be documented before they disappear (sad to hear about the Roma, and Alfredo's). You've created a superb and much needed resource for a massively undervalued area of post war popular culture and experience. Thank you! Just thought I'd drop a line to say you have created a brilliant and very worthwile website. Very funny and very well designed. I have just been to your fantastic website on lost cafes... Thanks for such a fantastic site. It's great to know that there are other people out there who appreciate such valuable heritage. I'm from Dublin originally and the last five years of economic boom have seen lots of fantastic 50's and 60's caffs disappear which is very gutting. Upsets me every time I go home! I have quite a passion for them and I am always on the lookout for little gems, so your site saved me a lot of time and footwork! Great site! I particularly love all the old seaside cafes having gone to school and art school on the north norfolk coast - I am a photographer who loves interiors especially ones with a history and intimate nature that is untouched by the never ending stylising of some ';groovy' interior designer. I feel inspired to seek some out to photograph for posterity. Both the content & design of your site are superb. I can't find any mention of the Lorelei on Bateman St, Soho. Apologies if I've missed it. This coffee shop / pizzeria looks untouched since about 1958 - it even has outside toilets. A good formica & leatherette pub is the Wheatsheaf on Stoney St (near Borough Market) - especially the public bar on the left hand side. May have changed since I was last there - the whole area is threatened. Website of the Month...When Trocchi boasted to Greil Marcus that Debord had had an eye for the lost histories and hidden spaces of a city, he would not have anticipated the coming of these greasy spoon aesthetes with a whole new spin on café intellectualism. Classic Cafes is neither a heritage industry route march nor trainspotter's paradise, but a thoroughgoing examination of those back street spaces of London that are rapidly caving in to pressure from Starbucks and Prêt. Not averse to putting their money where their mouth is and trying the food, Classic Cafes is about more, much more. Little wonder that Iain Sinclair is featured on their site, for he too has featured a multitude of Classic Cafe-esque eateries in a number of his works. Also worth a look is their bibliographic survey of writings on the café and café society... certainly worth its own place in the Michelin Guide. Just surfed in here from the links page on a Chris Morris site; was intrigued to see whether you knew about the closure of the lovely place in Wells St and you certainly do! I was gutted when i saw it shut down as it was a short walk from my workplace and did a mean focaccia chicken sandwich - nice people too. Then I ended up in M&S. Oh well. Congrats on the site and make sure you keep it going as it's a unique historical archive. I love this website almost too much. Since moving back to London a few months ago, I have mourned the loss of its character and individual charm to the ruinous, tsunami-like tide of chain coffee bars, restaurants and shops aimed at the capital's burgeoning masses of Nathan Barleys and wannabe It-girls. For me, the kind of establishment your website quite rightly glorifies is the essence of London and if more are saved as a result, then that's something to be thankful for. There were some good places in the Welsh Valleys and in the old Birmingham Bull Ring, too, but the genre as a whole is an endangered species. This website is as much something to treasure as the cafes themselves. Nice one. Both the content & design of your site are superb. I can't find any mention of the Lorelei on Bateman St, Soho... This coffee shop / pizzeria looks untouched since about 1958 - it even has outside toilets. A good formica & leatherette pub is the Wheatsheaf on Stoney St (near Borough Market) - especially the public bar on the left hand side. May have changed since I was last there - the whole area is threatened. One of the best pub interiors in north London is the Marquess Tavern in Canonbury St , N1 (an Edwardian Youngs pub, with some 30s-looking bits, as yet unmodernised) - this is a lovely pub, always heartbreakingly deserted, even on Sunday lunchtimes. Magnificent website. Have you ever encountered the 'Grosvenor' in Camberwell? I drive past it every week on a Tuesday at about 8pm, yet I have never seen a single person patronising this establishment. Not one. As far as I can see from my driver's view on the other side of the road, it appears to be a 60's steakhouse which I can well imagine would have been rammed every night at some stage, but I am curious how it stays open at the moment given the apparent - and absolute - lack of trade. Thanks so much for your fabulous efforts - [the] site consistently fills me with joy. Love it, love it, love it. Thank you for a moving, nostalgic and beautiful site. I am a big fan of English greasy spoons... That sense of interior, mood, architecture and atmosphere. I have lived in South London for 16 years and have fond memories of solitary afternoons in cafes in East Dulwich, Peckham and - over the last 12 years - Brixton, where I now live. You may be interested to know that the Terminus in Brixton is no-more having succumbed to the blandification and gentrification going on here now. I feel very sad that so many of these gorgeous cafes have gone for good. Gone the way of so much of old London. The future? Imagine a Patrick Cox loafer stamping on a human face forever! Thanks for giving the world such a cool site! I thought I was mad for liking them, but I can't help myself, and now there is a site for my obsession! I live in Brum, and there's still some cool cafes to be found. I live literally around the corner from 'Michael's Cafe' - with wooden panelling up to the middle of the walls, and formica tables... Dudley and Wolverhampton have splendid old cafes too. I have actually been timewarped in one of them. the radio started playing 'Keep on Running' and I was transported back in time. 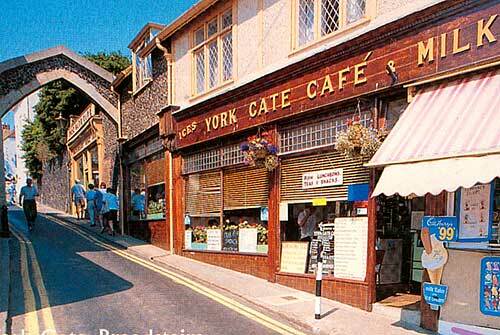 The Isle of Wight is a fantastic place for old cafes. In fact, the entire island hasn't changed much for the past 30-odd years. even the bus stop signs are vintage! I used to go to one particular cafe all the time because it has such fantastic wooden banquette seating. I went there with my friends when the Mod rally was on - and yet again, there was a time slip... There was an ace 'spoon' in Brum city centre, complete with a bloke behind the counter with a curly moustache but they got closed down as they used to bring binbags through the eating area. Your site is, like the best cafes, a true gem. Really thrilled to find it. Quality cafes are a rare breed in Devon - tea rooms and cider bars are more the cultural heritage here - but I feel I should give a mention to Macari's in Torquay, a favoured haunt from my youth. Situated on the harbour, the friendly Italian family have been serving grockles and locals alike for forty years, and besides the fantastic 50s decor (Alpine murals and the like) and odd pricing policy (nothing costs £1.03 these days! ), it also boasts the best coffee in South Devon. Sadly, I do know that it has recently been refitted, and as yet I haven't had the heart to go back and see what they've done. Still, I have faith in the family that runs the place, so I don't envisage anything too horrific. We'll see. Other recommended spots around Devon include Expresso of Cornwall Street, Plymouth (decor's a bit patchy, though) and Annie's of Market Street, Torquay (very cheap Greek-run greasy spoon not changed since the 60s.) However, if moribund seaside dreariness - soggy chips, tomato-shaped ketchup bottles, undrinkable tea etc. - s your thing, a trip to Teignmouth or Dawlish wouldn't go amiss. Exeter used to have some nice joints, but the herbal tea and mochachocaccinolatte brigade killed them off years ago. Long may your fine website continue. a thousand blessings upon your sublime site... I just wanted to say thank you for your great website. I first went to the Market Cafe in Spitalfields [RIP] in 1966 with my greengrocer grandfather who bought fruit and veg in the market. I totally agree with you that Spitalfields is being destroyed by soulless fashion dotcons and the trash boutiques full of tat where they justify their existence. Sadly I think it's too late stop the rot. I only discovered your site today, and I just wanted to say how fantastic it is. It's really given me an appetite for venturing out beyond my local area and discovering new (or new-old) eateries. Classic Cafes has never bored me. Please do not waste your talent as a travel writer - kindly turn Classic Cafes into a book forthwith. I'm waiting to buy the first copy. Hi I just clicked on your site from a link on the Pulp homepage. I think it's great & v useful - lots to check out!! Not sure if you would be interested but I have a site called 'Ancient Monuments Society' We deal with buildings of all ages and all types. Wonderful site! Found it from the link on the '20th Century Society' site. Thank you. Hi - love the Classic Cafes site. I was looking for a decent breakfast in London and came across Pellicci's - found myself in a really cool place...I had a great meal, and being a bit of a Kray enthusiast I was near ecstatic to hear that it was a regular haunt of theirs. (I was told that the Reggie Kray funeral procession stopped for 20 seconds in front of the cafe.) I thought I'd weigh in with a chance to crow about the fun and serendipitous time I'd had. Good luck, and thanks again for a great website. Love the site's detailed reviews - fascinating! Your web-site just gets better and better - fantastic. Went to Broadstairs for the first time this weekend and I must concur with all you say about the place - time has stood still and it's all the better for it. I am stunned at the quality of the design and research of the site and the sheer dedication you must have. When I moved to London 14 years ago one of the things I absolutely loved was the abundance of creaky old Gaggia machines in these relics to a more innocent yet infinitely more glamorous age when sipping an Italian coffee signified cool and sophistication. I have visited your classic cafes site and have made it one of my favorites. It is really superb and I shall from this day forward see these monuments of magnificence in a new light. Indisputably the work of a major webmaster. Congratulations. What a great site! We live in Hackney, N1 (no it isn't all Islington), and my 80 year old mum and I will be looking for and trying out the many cafes on your site we didn't know existed. Our favourite local cafe was Arthur's at the end of our road in Kingsland Road, E8 (I think, but Kingsland Rd changes postcode at various points). It's not one of your historic cafes, but it was a great local place. We'll keep our eyes open for other interesting places on our travels, and thank you again for such a great website. Best wishes and keep up the good work...the site's fantastic. very good indeed. Great design work - simple and effective...a site which looks nice, is easy to navigate and loads quickly. Fantastico! Website of the month has got to be Classic Cafes, a site celebrating London' greatest 50s and 60s vintage cafes. A cornerstone of London culture, the caff or 'greasy spoon' is an institution. This site name-checks the best of the Italian-styled cafes with reviews, a ery and a detailed history of their evolution. Drool over the Formica and dig those clashing color schemes - then pay them a visit and soak up the unmistakable ambience of a classic London caff! I really enjoyed the site and have started to appreciate these forgotten treasures: long may they live! Your site is a valuable resource and I will visit again! Great site. Thanks for the memories. Thank you so much for highlighting and promoting the conservation of these wonderful spaces. I'm an east-end based, fifties appreciator so was greatly cheered I found your web site last week and paid a long overdue visit to my localclassic cafe, Pellicci's, on Saturday. I haven't had such a good time in ages. I found myself unable to quit beaming from ear to ear from the moment I walked in, uncertain of how I might fit in to such a tiny space let alone move my elbows whilst eating, until the moment I left in a cloud of steam with the kind wishes and merry screams of "Fank you very much yang lady" from the truly phenomenal, highly amusing staff. I have delved deep into your site and 'tis indeed a treasure. ClassicCafes - what a wonderful website! As a Chez Monique regular (and occasional Pellicci's and Pancras Road Railway Cafe visitor - plus many others), it's so lovely to see there are others out there who feel the same. These places are special. And you are so right about plastic seating bolted to the floor - a real mistake. Like Sally, I mourn the sad loss of the original old REAL Roma Cafe. It was heartbreaking to see it in its new incarnation. And I recently found out that Nick's on Leyton High Road, E10 (not to be confused with Mick's Family Diner on Francis Road in the same neighbourhood!) has closed down. I don't know when this happened - it was a while since I'd walked that way - but building work for whatever is going to replace it is now well underway. Nick's was truly unique, with a "distressed primary school" colour scheme of thick layered-on-over-the-years bright blue and red gloss paint. And the all-important freestanding wooden chairs, some - it has to be said - rather too wobbly for comfort (especially after a huge cooked breakfast, if you know what I mean) plus struggling-to-survive houseplants. The people who ran it were delightful, with a genuine old-fashioned courtesy. And there was always a peaceful, relaxed vibe about the place. I never saw it busy or crowded - except perhaps on match days at the nearby Leyton Orient - and that was, in a strange way, part of its attraction. A great place for reading the Saturday Guardian over a prolonged breakfast - and stepping out of time. Maybe it will re-open - but I don't think it will ever be the same. (Just before I go, a quick footnote about Mick's Family Diner, mentioned above. It doesn't meet the Classic Cafe criteria, but it has the right kind of feeling to it. And if it's left to its own devices for a good few years it might age into a classic....) Anyway, thanks again for a really worthwhile website - I loved the Iain Sinclair link by the way. A great site... Excellent stuff. What about if we have suggestions to offer? a work of genius as a cafe fan since childhood it's such joy to find like minded souls in the world - an essential antidote to the horrors of invading and ever multiplying aroma, costa, starbucks et al.....killing off all sense of character and charm in our streets. long may your good works continue! A message to say Well Done for producing the best website I've ever come across! You are indeed people after my own heart, which breaks every time a classic caff is re-fitted (to be blunt I would rather they were closed down than stripped of their fittings and bastardised into a modern eaterie)...Living as I do in East London, I miss the Brunest at Mile End a lot. But you have omitted my other deeply mourned favourite... the Roma Cafe on Lea Bridge Road, Leyton, E10. It lost it's glorious pale green formica and chrome exterior and wooden and formica interior and is now refitted in garish yellow and red with those dreadful joined together seats in the McDonalds style. Disaster!...I came past Alfredo's in Islington the other day (I just have to look at the 'Ices 2d and 6d' signs in the window evertyime I am in the area!) and was horrifed to see it boarded up. Has it gone forever. What a tragedy if it has. Keep up your great work.